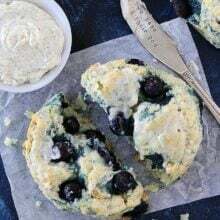 Blueberry Cream Cheese Biscuits are soft, tender, and flaky biscuits that are perfect for breakfast or brunch. 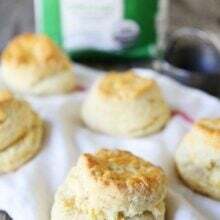 You will love these easy homemade biscuits, especially when you Serve them with salted vanilla butter! Homemade biscuits are one of our favorite weekend breakfast treats. 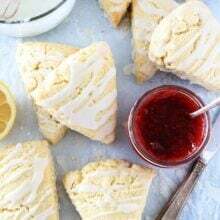 You can’t beat a warm biscuit right out of the oven, especially when you slather that biscuit with butter and homemade jam. Don’t be intimidated by making homemade biscuits, especially these Blueberry Cream Cheese Biscuits. They are easy to make and SO light and fluffy! The biscuits are made with plenty of butter (a biscuit MUST), buttermilk, AND cream cheese. Yes, cream cheese in biscuits. Jessica is creative like that and the cream cheese addition makes these biscuits SO good! 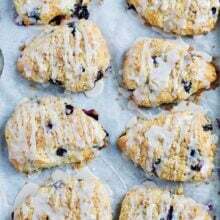 The biscuits are also filled with plump and juicy blueberries. Our boys love blueberries and were super excited about the blueberry addition. The blueberries really make the biscuits special. Oh, and let’s not forget the salted vanilla butter. It is the perfect finishing touch for the biscuits. Slather that butter on a warm biscuit and you will be in biscuit heaven, especially when you bite into a juicy blueberry! Biscuit perfection! Bake the biscuits at a high temperature, 425 degrees F.
Make sure your butter, cream cheese, and buttermilk are COLD. Don’t overwork the biscuit dough. If you do, the biscuits will be tough and you won’t get the flaky texture you are looking for. Carefully mix in the blueberries. You can use fresh or frozen blueberries, but be careful when you are mixing them in. You don’t want to smash them, if you do, you will have blue biscuits. Use a biscuit cutter to cut the biscuits. If you don’t have a biscuit cutter you can use a circle glass to cut the biscuits. Make sure you form the biscuit dough into a circle that is a 1 1/2-inch circle. Yes, you want the biscuits that thick. You will have extra dough after cutting your first round of biscuits. Gently form the dough back together and cut more biscuits until all of the dough is used. The biscuits will puff up in the oven. Bake until golden and high. Serve warm with salted vanilla butter, if desired. 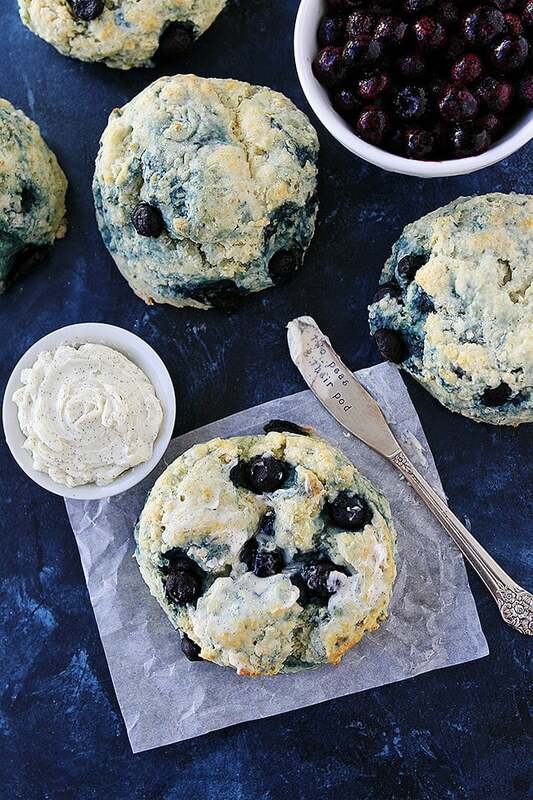 You are going to love these scones that are BURSTING with blueberries! They are the perfect treat for breakfast or brunch. I really think you should make them for Easter brunch this weekend. 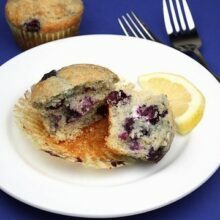 They are also perfect for Mother’s Day brunch, the 4th of July, Father’s Day, or any morning. You don’t need a special occasion to make these biscuits. They are easy to make and will brighten any morning. 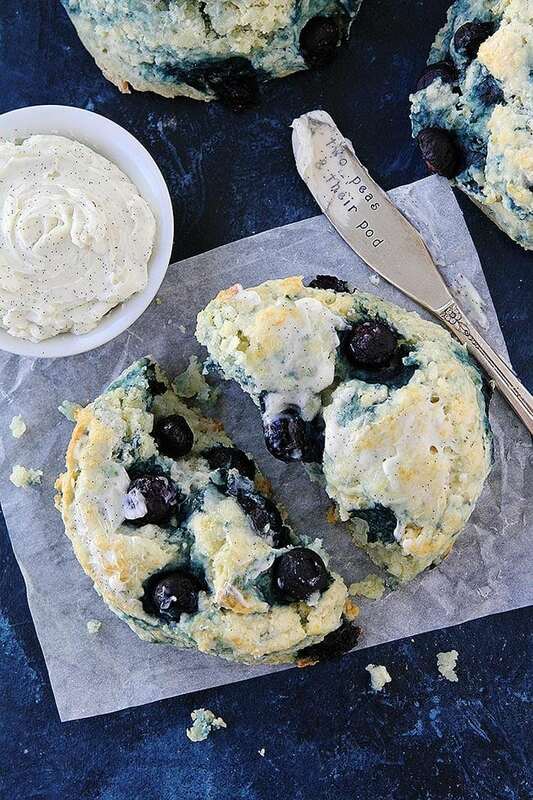 Blueberry Cream Cheese Biscuits are going to be a regular weekend recipe at our house. Our boys are already begging us to make them again. Thanks Jessica for the recipe! And make sure you check out Jessica’s cookbook, The Pretty Dish. You will LOVE it! It is my new favorite cookbook. I am obsessed with all of the recipes, photography, and the fun DIY beauty recipes. Yes, there are fun DIY’s for bath bombs, salt scrubs, lip gloss, and more! Jessica thought of everything! This is a great book to give to a friend, sister, mother, daughter, anyone!! You will love it! 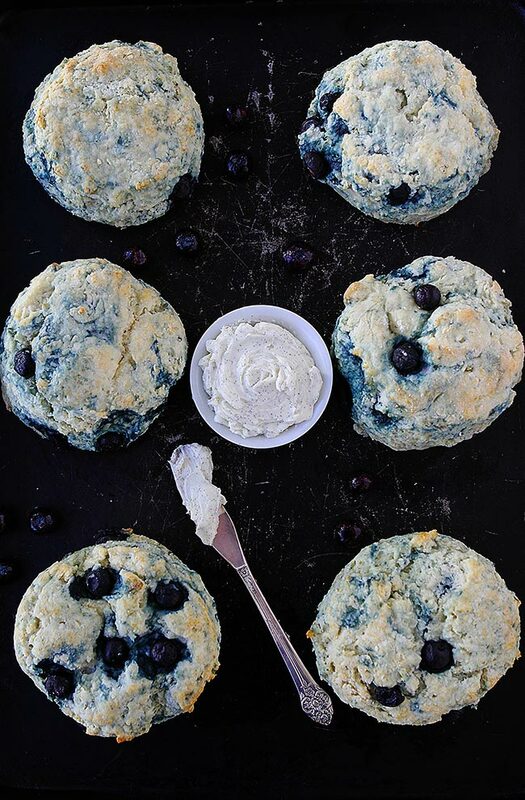 These soft and flaky biscuits are bursting with blueberries! They are great for breakfast or brunch. Don't forget to finish them off with salted vanilla butter, the butter makes the biscuits extra special. To make the biscuits, in a large bowl combine the flour, baking powder, baking soda, sugar, and salt. Add the cream cheese and butter and use a fork, pastry blender, or your hands to mix until coarse little crumbs form. Make a well in the center and pour in the buttermilk. Stir with a large spoon until just combined. Fold in the blueberries. Use your hands if needed to bring the dough together. Pat the dough into a circle that is about 1 1/2 inches thick. This will make tall biscuits and that is what you want. Using a biscuit cutter, cut the dough into rounds and place on a nonstick baking sheet. Bring the extra dough together and cut more biscuits, using all of the dough. Bake for 10-12 minutes or until the biscuits are golden and high. Let cool slightly before serving. To make the vanilla butter, in a bowl mix the butter, vanilla bean paste, and salt until combined. Serve the butter on the warm biscuits. You can keep this at room temperature or store it in the fridge for a few days. I love Jessica’s book and this recipe is dog eared for sure. I bet the cream cheese makes them so amazing! Those are seriously loaded with blueberries!! These look perfect for a weekend brunch!! These are a must-have for Easter brunch! What size biscuit cutter did you use? Can’t wait to try!Baking them right now. I made these this morning and they turned out great! My family loved them. I couldn’t find vanilla bean paste so to top it I made the Maple Glaze recipe from your Blueberry Sour Cream Waffle recipe. So Yummy! You can if they are super juicy, but I didn’t and they were just fine. I made the biscuts this evening. Learn from my mistake- use fresh blueberries. Frozen blueberries made the dough too wet. Even after adding a good amount of flour I had to resort to drop biscuts. 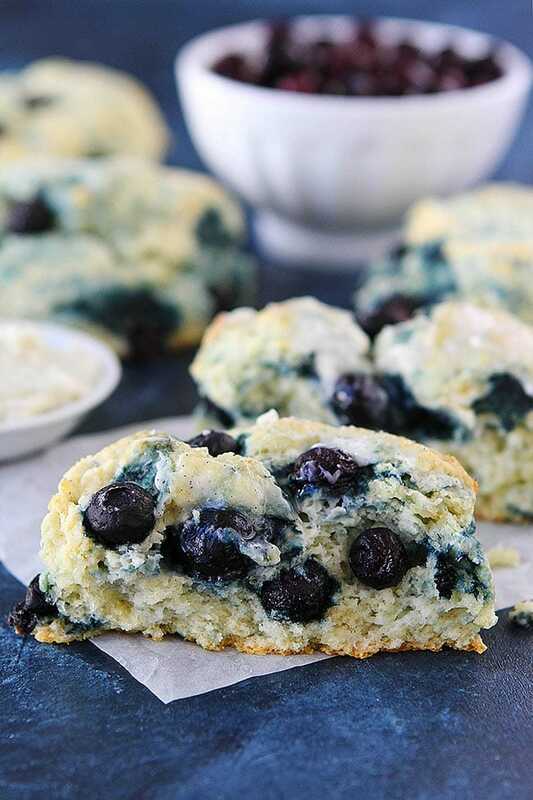 The blueberry juice, from melting blueberries, made the biscuts look green- like green mold. They taste delicious but dont look very appealing. These were wonderful! I didn’t have enough blueberries, so I added some strawberries as well. Delicious!! Do you think these would turn out just as great as plain biscuits- no fruits added?